Elijah Hudson Bagwell was born in 1847 in Tuscaloosa County, Alabama. He was the son of Wiley George Bagwell and Carrie Euphemy Euphania Lollar. Elijah Hudson Bagwell married Charity Ann Upton on 9 February 1870.2,1 Elijah Hudson Bagwell died in 1910 in Tuscaloosa County, Alabama. He was buried at Wiley Cemetery, Tuscaloosa County, Alabama. [S70] LDS Submission - by Eda JARAGOSKY. [S69] LDS Submission - by Sheryl Bagwell. Charity Ann Upton was born in 1850 in Yellow Creek, Tuscaloosa County, Alabama. As of 9 February 1870,her married name was Bagwell.1,2 She married Elijah Hudson Bagwell, son of Wiley George Bagwell and Carrie Euphemy Euphania Lollar, on 9 February 1870.1,2 Charity Ann Upton died in 1900 in Tuscaloosa County, Alabama. She was buried at Wiley Cemetery, Tuscaloosa County, Alabama. [S118] Jeanie Patterson Newell, Edmonds Family Cemetery / Musgrove Family Cemetery. [S119] Beverly Edmonds Downs, "William A. Edmonds Family", The information following was provided by Beverly Edmonds Downs the great-great-granddaughter of William A. Edmonds. [S835] United States Federal Census, Washington, District of Columbia, Population Schedule: Fayette, Alabama; Enumeration District: 76; Supervisor District: 1; Page: 7, Dwelling: n/a, Family Number: 55, Date: 1880. [S834] United States Federal Census, Washington, District of Columbia, Population Schedule: Winfield, Marion, Alabama, Emuneration District: 66, Supervisor District: 6, Sheet: 18A, Dwelling: 315, Family Number: 326, Date: 1900. Lisa (or Liza) Jane Beasley was born on 10 October 1868.3 Lisa (or Liza) Jane Beasley also went by the name of Babe.2 As of 8 January 1901,her married name was Bagwell. She married Wiley Dyer Bagwell, son of Wiley Bagwell and Mary Polly York, on 8 January 1901.1,2 Lisa (or Liza) Jane Beasley died on 29 April 1974 in Fayette County, Alabama, at age 105. James Anderson Savage married Sarah Elizabeth Shaw. James Anderson Savage was born in 1825 in South Carolina. He was the son of John S. Savage and Ann H. Gillespie. 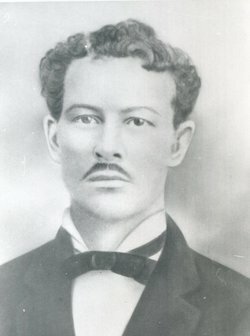 James Anderson Savage married Jane Caroline Bagwell, daughter of Fredrick Bagwell and Margaret Ann (Peggy) Crawford, in 1849 at Choctaw County, Mississippi.1,2 James Anderson Savage died in 1884. [S1183] Jane Caroline Bagwell Savage Grave Stone, Find a Grave, www.findagrave.com. [S1289] Sarah Bagwell Grave Stone, Find a Grave, www.findagrave.com. [S2880] Email from James D. Waddell dated April 2015 to Hunter Wayne Bagwell - Subject Line: John Daniel Bagwell and Family. [S1983] Applicant: John Darwin Waddell, "SAR Application of John Darwin Waddell for John Daniel Bagwell." [S71] LDS Submission - by Anne C. BOWDEN. [S223] United States Federal Census, Washington, District of Columbia, Population Schedule: Berkshire, Gwinnett, Georgia, Sheet: 130, Dwelling: 6, Family Number: 6, Date: 1850. Nancy Ann Bagwell, daughter of Wiley George Bagwell and Carrie Euphamia Lollar, was born in Alabama in November 1851. She grew up with four older and five younger siblings. She married John Wheeler Whitson in Tuscaloosa, Alabama on September 8, 1880. Mr. Whitson’s first wife, Sarah Lollar (Nancy's first cousin), had died the previous year following the birth of her fourth child. Nancy and John Whitson had two children, one of whom died in infancy. Their daughter, Susie Whitson, was born in July 1882. The month before Susie's birth, Thomas Whitson died, leaving Nancy a widow with five children under the age of nine. Nancy never remarried. Elizabeth Jerusha Bagwell was born on 23 December 1853 in Tuscaloosa County, Alabama. She was the daughter of Wiley George Bagwell and Carrie Euphemy Euphania Lollar. As of 18 September 1874,her married name was Karrh. Elizabeth Jerusha Bagwell married James Alvin Karrh on 18 September 1874. Elizabeth Jerusha Bagwell died on 7 September 1898 at age 44. She was buried circa 8 September 1898 at Wiley Cemetery, Tuscaloosa County, Alabama. James Alvin Karrh was born on 24 October 1852 in Walker County, Alabama. He married Elizabeth Jerusha Bagwell, daughter of Wiley George Bagwell and Carrie Euphemy Euphania Lollar, on 18 September 1874. James Alvin Karrh lived in 1900 in Walker County, Alabama. He died in 1919 in Alabama. Sarah Sally J Bagwell was also known as Susanna. She was born on 11 August 1858 in Tuscaloosa County, Alabama. She was the daughter of Wiley George Bagwell and Carrie Euphemy Euphania Lollar. As of 3 December 1876,her married name was Dunn. Sarah Sally J Bagwell married Daniel Jackson Dunn on 3 December 1876. Sarah Sally J Bagwell died on 21 September 1927 at age 69. She was buried circa 22 September 1927 at Wiley Cemetery, Tuscaloosa County, Alabama. Daniel Jackson Dunn married Sarah Sally J Bagwell, daughter of Wiley George Bagwell and Carrie Euphemy Euphania Lollar, on 3 December 1876. Lucy Grace Anderson married William Wiley Bagwell, son of Wiley George Bagwell and Carrie Euphemy Euphania Lollar, after 1900. Sarah Lelia Baker was born on 8 January 1862. 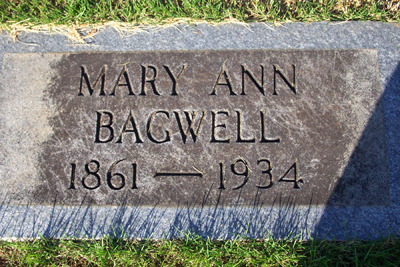 As of 16 June 1881,her married name was Bagwell. She married William Wiley Bagwell, son of Wiley George Bagwell and Carrie Euphemy Euphania Lollar, on 16 June 1881 at Tuscaloosa County, Alabama. Sarah Lelia Baker died on 16 November 1952 at age 90. She was buried at Evergreen Cemetery, Tuscaloosa, Tuscaloosa County, Alabama. Mrs J M Whitson, 82-year-old Lutie woman, died at her home there Saturday, May 18, after a serious illness of nearly eight months duration. She had lived in that community for 33 years and was one of its oldest and most beloved residents. Funeral services were conducted Monday afternoon at the Church of Christ in Wellington, with Minister Loyd Smith of Lawton, OK, in charge. Pall bearers were Paul Starr, Ray Hyman, Selba Rainey, Gene Glenn, I 0 Ruby and Elmer Hiett. Hymns were "On Jordan's Stormy Banks", "Where We'Il Never Grow Old", "God Will Take Care of You," and "Safe in the Arms of Jesus." Burial was in the Wellington cemetery with the Ellis Funeral Home in charge. Mrs Whitson was before her marriage Susie Caroline Bagwell, the daughter of Euphamia nnd Wiley G. Bagwell. She was born in Alabama on May 12, 1864 and observed her 82nd birthday on Mothers Day. Mrs Whitson grew up in that state and was married there to J M Whitson December 21, 1879. Ten children were born to that union, all of whom survive. They continued their residence in Alabama for many years, during the time their children we're young. Then, in 1913, they left Tuscaloosa, where they had resided for a considerable period of time and came to Collingsworth County. They settled in the Lutie community which they made their home from that time on. Devoted alike to her home, family and friends, Mrs Whitson drew about her many who relied on her for guidance and inspiration and comfort. Despite her advancing years, she remained young in spirit as well as in actions. Mrs Whitson obeyed the Gospel in 1884 at Flatwood, Alabama and was a faithful member of the Church of Christ from that time on. At the time of her death, she was a member of the church at Wellington. She was active in church work for as long as she was able and contributed much to the religious life of her community. Surviving Mrs Whitson are her husband, J M Whitson; and the ten children: Mrs J Crosbyton, Mrs Hattie Stanley of San Angelo, Mrs F P Day of Dalhart, Mrs D W Kelley of Oklahoma City, Mrs Charles Aydelotte of Lubbock, E D Whitson of Panhandle, J C Whitson of Fort Worth, J N Whitson of Clinton, Okla., T B Whitson and A S Whitson of Lutie. Also 23 grandchildren, 19 greatgrandchildren and many others. Thursday, Thursday, May 23, 1946. She was buried at South Fairview Cemetery, Wellington, Collingsworth County, Texas. James Monroe Roe Whitson married Suzie Sally Caroline Bagwell, daughter of Wiley George Bagwell and Carrie Euphemy Euphania Lollar, on 21 December 1879 at Shamrock, Texas. Dovie Bagwell was the child of Wiley George Bagwell and Carrie Euphemy Euphania Lollar. Hugh Gauntt Squire Lollar Jr.
[S256] Hunting For Bears Genealogy Society, Alabama Marriage Collection, 1800-1969 [database on-line]: Nancy Bagwell.